In some beek circles, the topic of feeding bees is controversial. So let’s explore some of the issues and angles on feeding. First of all, if you want to pursue strictly organic beekeeping, the rules are no feeding of sugar water, period. So most of us actually practice a modified organic beekeeping approach: no hard chems, but we do feed sugar. Someone asked, “Do you feed your bees”? Yes, in certain times, absolutely. You would never consider NOT feeding your dog, cat, tropical fish, horse or cows, would you? In this new era of loss of pollinator habitat, monocultural, Round‐Up‐ready agriculture, extensive homeowner expanses of Scot’s Turf builder‐perfect fescue, etc, etc. Why would you think we would NOT have to sometimes feed our bees? Calculating how much honey a colony will need in winter is a bit of an art as well as a science. Is 60 lbs just right? Is 80 lbs overkill and wasted? Will the winter be so severe that the larger amount of stores is still not enough? Will the bees find their way up and over to those excellent honey stores above? Or will they move the wrong direction and then die in cluster by starvation with ample honey supplies only inches away? There are too many variables to have any one simple explanation. Sometimes we lose the bees in spite of all our best efforts and intentions. But on average, we can effect the outcome of their survival by ensuring they have adequate stores – adequate in the spring prior to the nectar flow, adequate to survive the summer after part of the honey crop has been removed, and adequate reserves built up in the fall in order to make it through winter. Doesn’t the fall nectar flow give the bees enough honey to get through the winter? Short answer: sometimes, and maybe. It all depends. Every year is different; every location is different. So feeding is something to keep in mind to empower your bees at times, to push them forward faster than is normally possible and to preserve them for the future. In the spring, before the natural nectar flow begins, feeding is absolutely critical to complement the huge influx of pollen they are using to initiate wide scale brood production. Sugar water is converted to honey and is one of the essential energy sources for heater bees to maintain brood temperature, for the foragers to burn as flight fuel, and for all bees to continue their efforts. 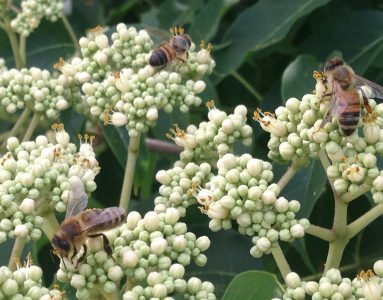 Cybil Preston, MD bee inspector and former president of SBA, asked me once why I was still feeding a package colony in the middle of the nectar flow (May 18‐ 12 June). I explained, even during the nectar flow, there is some bad weather when bees can not collect nectar. But they can still get to the feeder and be encouraged to draw out comb. The young bees can still collect the critical carbohydrates necessary to stimulate great wax production at night (unless someone has bred a new species of bee that can navigate at night!). Of course I would not feed sugar water and allow the bees to convert it into honey, then extract the result and call it real honey. When the nectar flow is on, an established colony does not need to be fed. But if I am building up a package and have no intention of extracting honey from them, why not feed, boost them? The expert in Maryland Beekeeping, the late George Imrie spoke of feeding bees sometimes in his famous “Imrie Pink Pages”. His advice was, in the first year, feed often and in quantity to get as much drawn comb as possible. Drawn comb is like money in the bank. It is the currency of your bees’ future success. It is the tool you can leverage for expansion, insurance, and production (of honey and bees). George said first year beekeepers would have to feed long and hard if they wanted to get two full boxes (deeps) of foundation drawn out to comb by September! Some danger however lurks in the feeding regimen that must be mentioned. Feed after the nectar and pollen dearth begins and you risk the uncontrolled initiation of robbing. Strong hives will rob out weaker ones if they get a hint of sugar or honey being easy and cheap to steal. Spill some sugar water on or near a hive, or use a front, Boardman feeder at that time and you have a recipe for disaster. Say good bye to your beautiful bees because the scouts from any area hive will identify the target, communicate the agack order and the bagle will ensue. The ending could be bad. Others will say feed too much early on and your hive will swarm. Maybe this is true, but only if you are unaware of congestion and don’t take measure to relieve it early and don’t provide expansion space upwards, or provide foundation for them to work on. Feeding can be done with plastic baggies (gallon size, filled half, slit in top) in an empty upper chamber above the inner cover or by using jars with very small holes in the lid place over the inner cover hole. An empty box is placed on top of the inner cover to protect the jar and I raise the jar up ¼ inch on sticks. Also available are inner division board feeders of many kinds (the one gallon size from Begerbee and Brushy Mtn) or the 2‐gallon size from Mann Lake, top box feeders made of plastic, hard styrofoam, or all wood, etc. etc. Critics will point out that your bees could die in large numbers inside the feeders, especially inner division board feeders and hive top feeders. And this is sometimes true. But keep a close watch on openings, bee access, and on providing ways for the bees to climb back up from the liquid and you should not have a problem. Seeing thousands of bees drowned in sugar water is a helpless, discouraging event. Keep hive top feeders bee‐tight! And yes, sugar is expensive and so is high fructose corn syrup (HFCS), but bees are expensive and valuable too. So, know why and how to feed. Understand what the rewards and risks are and use feeding to your advantage.